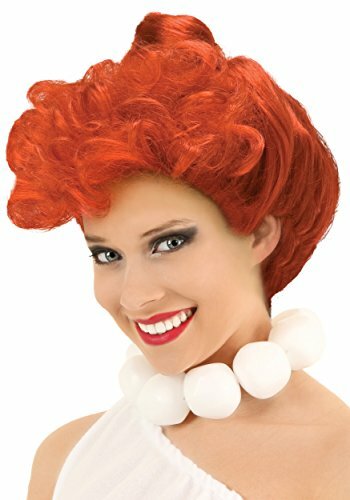 Fred's number one gal needs her Deluxe Wilma Flintstone Wig. Pair it with the matching costume for a trans-formative look. He'll scream yabba dabba do, once he sees your new do! 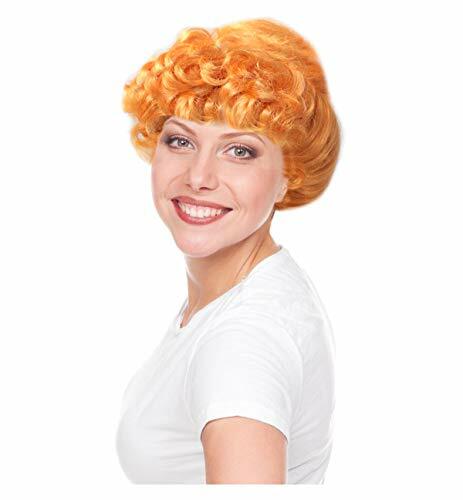 ONE UPDO ORANGE GIBSON CHARACTER COSTUME WIG This cartoon orange style wig comes with an updo bun on top with curls in front. 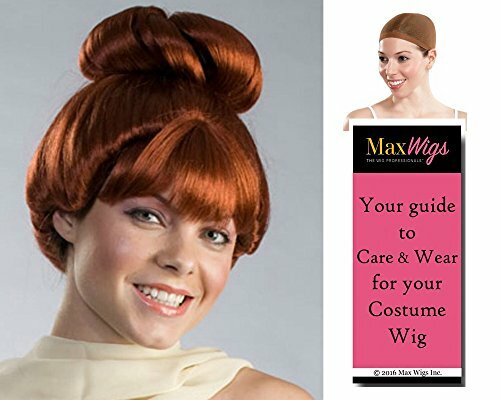 This wig makes a great Wilma Wig, Lucy Wilde Wig, Ms Frizzle Wig or any costume ideas that need a cartoon orange gibson style character wig. One size fits most adults and children ages 12 and up. Makes a nice addition to school plays, productions or for your favorite Halloween costume characters. Bring back a classic with the flintstones! rubies brings you their masquerade concepts line: high quality costumes from all of our most popular licensed lines a price you can manage. A world-leader in the creation of costumes, make up and accessories, rubie's costume company is a family-owned and run business based in new york state. With more than 60 years experience and the largest selection, rubie's has the costumes and accessories children and adults want for halloween and year-around dress up fun. When you're with the Flintstones, have a yabba-dabba-doo time! 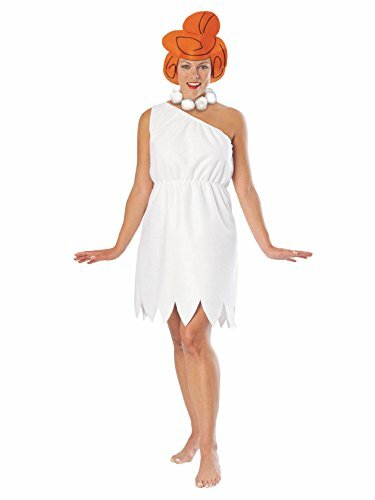 Put on this officially licensed Flintstones Wilma costume set for a Yabba-dabba-doo time! Features a white single-shoulder dress with jagged black and white zebra patterned trim on the top and bottom; oversize chunky white pearl necklace; and orange up-do wig completes this bed rock look! 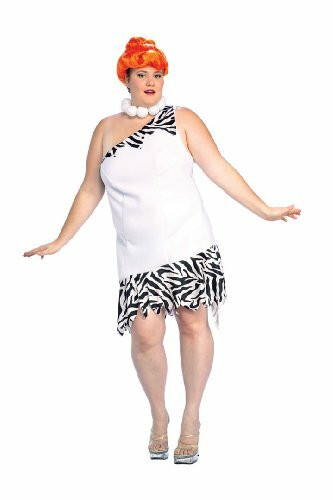 Coordinate with other officially licensed Flintstone costumes by Rubie's for a themed family look or with your friends for group costume fun! Rubie's Costume Company has been bringing costumes and accessories to the world since 1950. As the world's leader, we take our mission seriously to make dressing up fun! Mascots, rental quality costumes, masks, wigs, accessories, shoes, and every significant licensed costume you want to wear can be found under the Rubie's brand. Still family owned and still family focused, Rubie's brings you fun for every season: Halloween, Christmas, Mardi Gras, Easter, and every occasion in-between. He'll scream yabba dabba do, once he sees your new do! 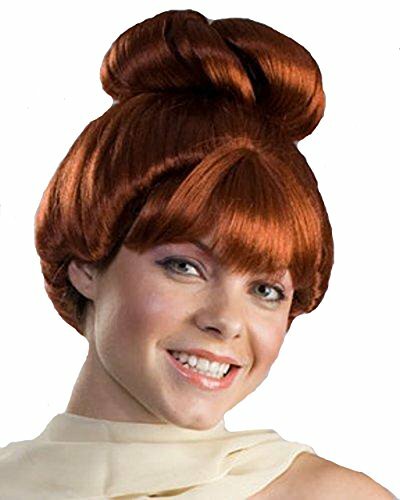 Our classic Wilma Flintstone Wig is styled with Wilma's signature bun and finished with long bangs. 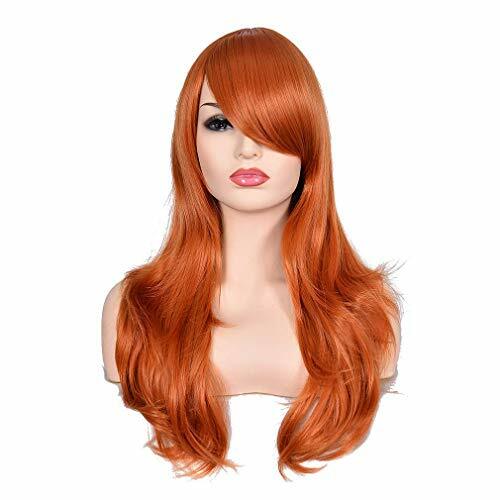 Wilma Fintstone Wig is 100% synthetic. One size fits most adults. Rubies' Costume Company has the licensed and non-licensed costumes, decor and accessories for every season: Halloween, Christmas, Mardi Gras, Easter and all in-between. Family-owned and operated in New York State since 1950, Rubies' has a serious mission to make dress-up fun and safe. You'll find traditional costumes for kids and adults, flirty looks for women, mascot and rental quality costumes, haunted house decor, masks, wigs, accessories, shoes and more - you'll find it all under the Rubies' brand!